Wisdom, a Laysan albatross, is at least 65 years old. 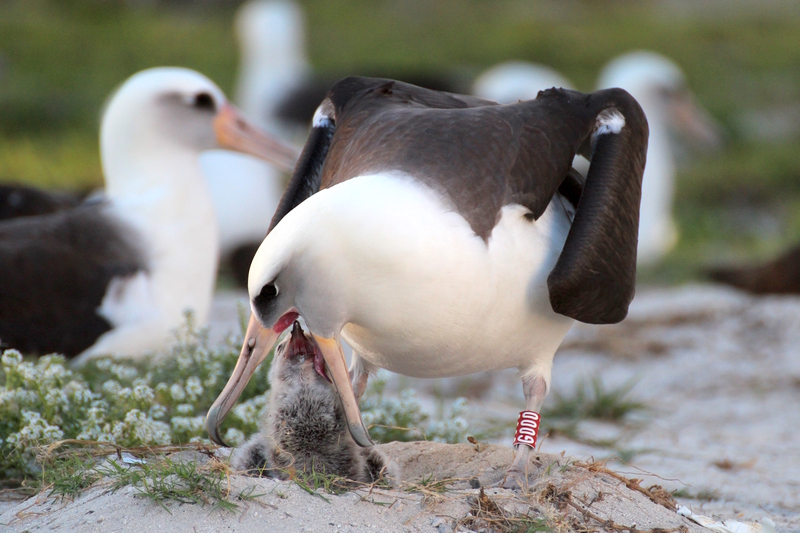 Her latest chick hatched at the Midway Atoll National Wildlife Refuge on February 1. Wisdom and her chick, Kukini, February 10, 2016. Image credit: Midway Atoll National Wildlife Refuge. A female Laysan albatross named Wisdom, at least 65 years old, is the oldest known wild bird. She was first tagged in 1956 when she was at least 5 years old, at the Midway Atoll National Wildlife Refuge, which is now part of the Papahanaumokuakea Marine National Monument. On February 1, 2016, Wisdom set yet another world record, becoming the oldest known wild bird to hatch a chick. Wisdom’s compelling story continues to astound scientists and her many fans around the world. Her new chick was named Kukini, which is the Hawaiian word for messenger. Wisdom’s extraordinary story started in 2002. 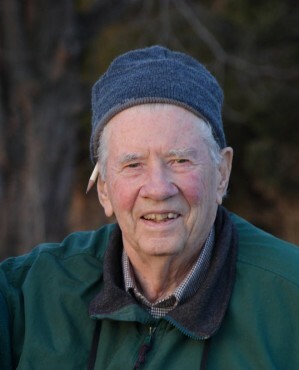 Chandler Robbins, then 82 years old and long retired from the U.S. Geological Survey (USGS), was nevertheless at work at the Midway Atoll refuge. Robbins, a distinguished ornithologist, made note of an identification stamped on a band that was attached to the leg of a Laysan albatross he had picked up. He also affixed a new band to the bird since the old one was in bad shape. Bird banding, attaching rings with a unique ID around a bird’s leg, is a way to track that bird’s history. If a banded bird is recaptured, details about its capture date, location and physical condition provide information about its movements and lifespan, and adds new data to the body of knowledge about the bird species. Robbins looked up the old band identification in the banding records to find out when that Laysan albatross had been banded and who had done it. The records showed that it had been banded at the refuge in December 10, 1956 … by him! Albatrosses tend to return to the same area to breed. In 2006, the refuge contacted Robbins to ask where he had banded his rediscovered bird. Robbins directed them to a location behind some old Navy Bravo barracks on the island. Volunteers soon located the bird where he said it would be. 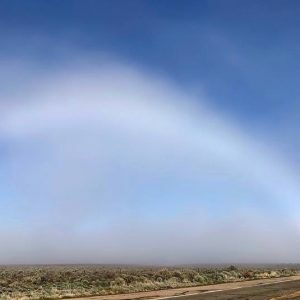 John Klavitter, the refuge biologist, returned to the nest to replace a metal band that Robbins had attached to her leg in 2002 with a red band inscribed with her new identifier, Z333, so she could be more easily found and monitored. Klavitter also named her Wisdom. Wisdom has a red band with a unique identification, Z333. Image credit: Midway Atoll National Wildlife Refuge. When I started banding albatrosses in 1956, we knew they could live a long time, at least 25 years, maybe 30; but we did not realize the aluminum bands we were using would be so corroded by sand and salt water that most would fall off in 20 years. We started adding replacement bands when we recaptured old birds, but most of the rebanded birds were not recaptured so we lost their identification. Fortunately I recaptured Wisdom twice and other banders rebanded her two other times, so for the first time we had her nearly complete record. I was really excited when I caught her in 2002 and found she was still alive and nesting. Wisdom and I have been having a personal race in recent years to see which of us will return each year. Last winter, Wisdom disappeared at sea before her egg hatched, so I thought I was the winner, but she came back to Midway again this winter and successfully hatched her egg so we are still tied, me at 97 years and she at least 65. … in this case the arrival of this chick and the amazing story of Wisdom both bring important messages. Traveling thousands of miles each year, albatross are indicators of the health of our oceans and face constant threats-marine debris, irresponsible fishing practices, habitat degradation and invasive species. Wisdom and her chick are a story of perseverance and serve as messengers that remind all people of the need to work together to aloha ‘aina – care for our world. Akeakamai (left) and Wisdom with their egg on November 28, 2015. Image via Midway Atoll National Wildlife Refuge. Wisdom’s mate, Akeakamai, feeds Kukini one of its first meals. Photo via Kiah Walker/Midway Atoll National Wildlife Refuge. Female Laysan albatrosses lay one egg each year; however, adults sometimes take a year off from breeding to wander across the northern Pacific ocean. Scientists believe that Wisdom has raised about 35 chicks, perhaps more, over her lifetime. 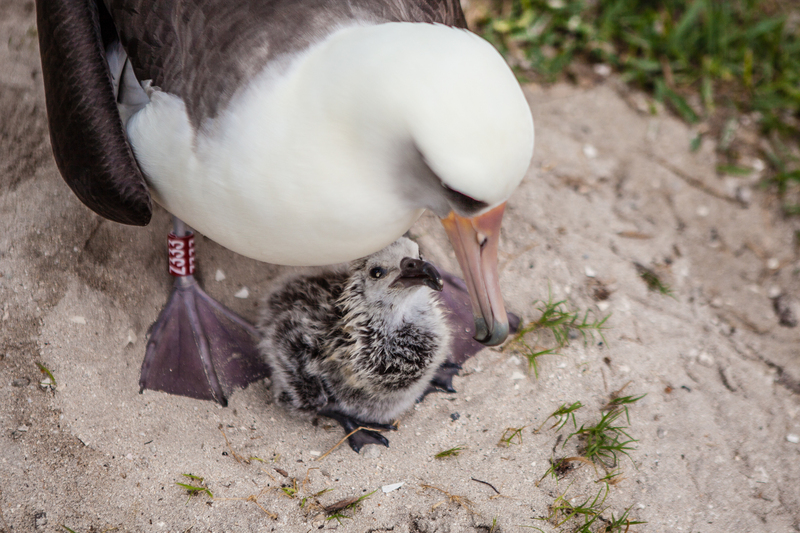 Since 2006, refuge staff have observed her hatch at least 8 chicks. Albatrosses are thought to mate for life, but it’s quite possible that Wisdom has had more than one mate over her long life. Laysan albatrosses return to their colonies each November to breed, during which time, mates engage in complex courting displays of coordinated head, leg and wing movements. After mating, the birds feed at sea, then the female returns to lay her egg. Wisdom laid her egg on November 28, 2015. 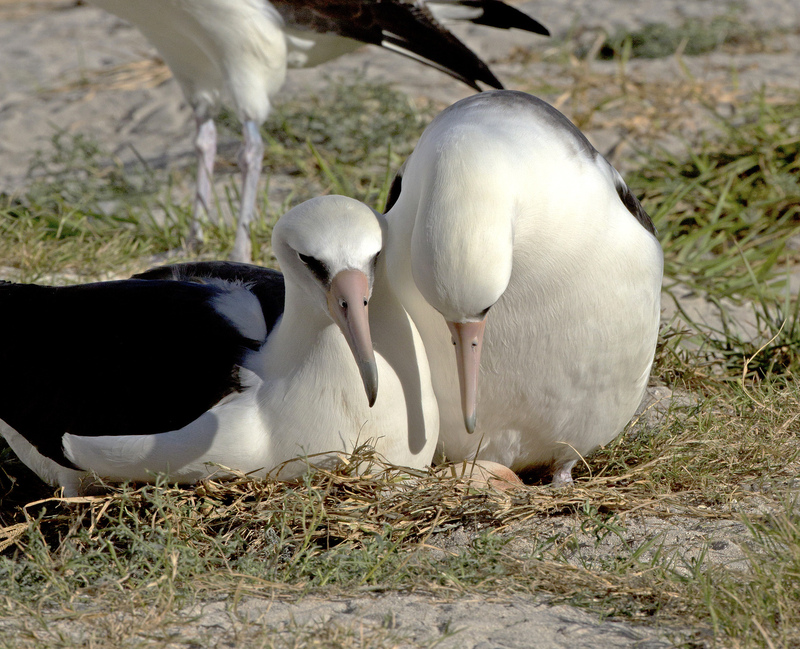 She and her mate, Akeakamai (his name was recently selected by public vote via social media from a short list of four names), took turns incubating their egg for 64 days. Kukini emerged from its egg on February 1, while being watched over by its father. The chick was fed a regurgitated oily mix of squid and fish eggs by Akeakamai for the next six days until Wisdom returned from her foraging trip at sea. Both parents will continue to care for Kukini until the chick fledges at about six months of age. From a scientific perspective, albatrosses are a critical indicator species for the world’s oceans that sustain millions of human beings as well. In the case of Wisdom, she is breaking longevity records of previously banded birds by at least a decade. With over a million albatross on Midway Atoll alone, this shows just how much is left to learn about the natural world around us. Laysan albatrosses travel great distances over the northern Pacific Ocean. They keep aloft with wings that span over 6 feet from one edge to the other, along with skillful maneuvers in the wind with very few, if any, wing flaps. Juveniles spend their first few years at sea, returning to the island where they were born, at around 5 years of age, to breed. Non-breeding adults are also ocean wanderers that can travel several thousands of miles in a year. That is up to six trips from the Earth to the moon and back again. Regular updates, including video, about Wisdom and her family are posted at the Papahanaumokuakea Marine National Monument Facebook page. Latest news about them is also available at the Midway Atoll National Wildlife Refuge website. 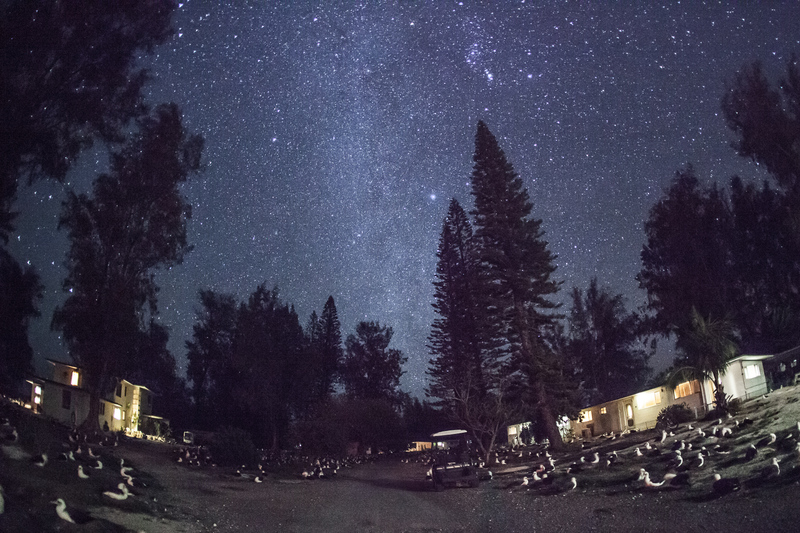 Laysan albatross colony illuminated by starlight at the Midway Atoll National Wildlife Refuge. Image credit: Kaipo/Paliku Productions. 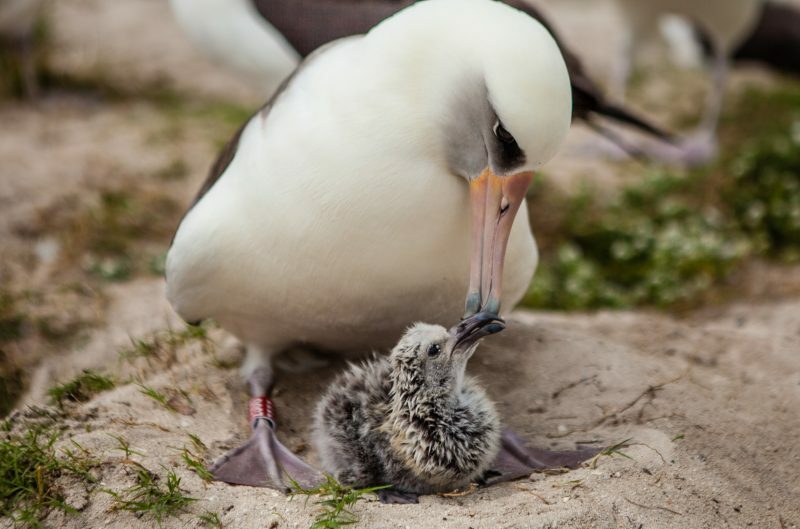 Bottom line: Wisdom, a 65-year-old Laysan albatross that’s the oldest-known wild bird, once again hatched a chick on February 1, 2016 at the Midway Atoll National Wildlife Refuge. She was first tagged in 1956 by ornithologist Chandler Robbins when she was at least 5 years old.